JUST AS WELL AS IT DOES FOR RURAL LANDOWNERS FOR KEEPING GOVERNMENT AGENTS AND LAW ENFORCEMENT FROM TRESPASSING ON YOUR PROPERTY! TRESPASS BY LAW ENFORCEMENT AND GOVERNMENT AGENTS! NARLO has released our new, Copyrighted No Trespass sign that beats and surpasses any other sign on the market, to keep law enforcement and government agents off the rural landowner's property. This could include but not limited to: census takers, process servers, county assessors, inspectors and even code enforcement officers. The language on the sign is based on a legal precedent from the 10th Circuit Court of Appeals case adjudicated in 2016. It stipulates that if a landowner, urban or rural, wants to prohibit intrusion on their property under the "knock and talk" implied license in U. S. Supreme Court cases known as BREARD v. ALEXANDRIA, 341 U.S. 622 (1951) AND FLORIDA v. JARDINES, 133 S. CT. 1409 (2013), they must have signage on their property, and literally at their front door, stating the owner REVOKES that Implied License. The 10th Circuit Court of Appeals precedent provides that authority to the property owner. Our new sign clearly makes that statement. You can read the 10th Circuit Court of Appeals decision HERE. This new 12" x 18" sign is designed to be a companion to NARLO's powerful, legally intimidating 18" x 24" No Trespassing sign. Over 7,000 of our large signs have now been installed on rural lands all over America. New orders come in almost every day. We have also established distributors for our large sign. IMPORTANT: To meet the strict interpretation of the 10th Circuit Court case referenced above and to make the "Revocation of Implied License" No Trespass sign truly effective, there should be a sign at the entrance to the property and one sign on, or very near, the primary residence. Consequently, the minimum order is two "Revocation of Implied License" No Trespass signs. 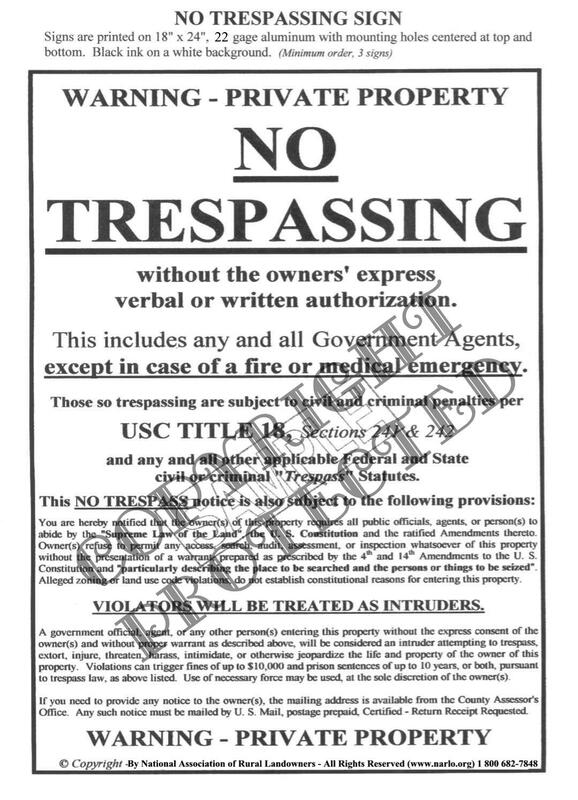 We have made provisions on this page to order one of our large 18" x 24" No Trespassing signs, together with two (2) of our "Revocation of Implied License" No Trespass signs. There simply is no other sign this powerful in keeping government agents and law enforcement off your property, anywhere in the market. ALASKA CUSTOMERS, PLEASE CONTACT US BEFORE ORDERING, AS ADDITIONAL SHIPPING CHARGES ABOVE THE INDICATED AMOUNTS, WILL BE REQUIRED! WE WILL NO LONGER ACCEPT ORDERS FROM HAWAII. THE SHIPPING COSTS RENDER WHAT WE CHARGE FOR OUR SIGNS, UNPROFITABLE! Please use the "BUY NOW" buttons below to order your "Revocation of Implied License" No Trespass signs with credit card payment, or click here to fill out and mail in your order with a check or money order. It's not the PRICE that's important. It's the POWER of the language on the sign. 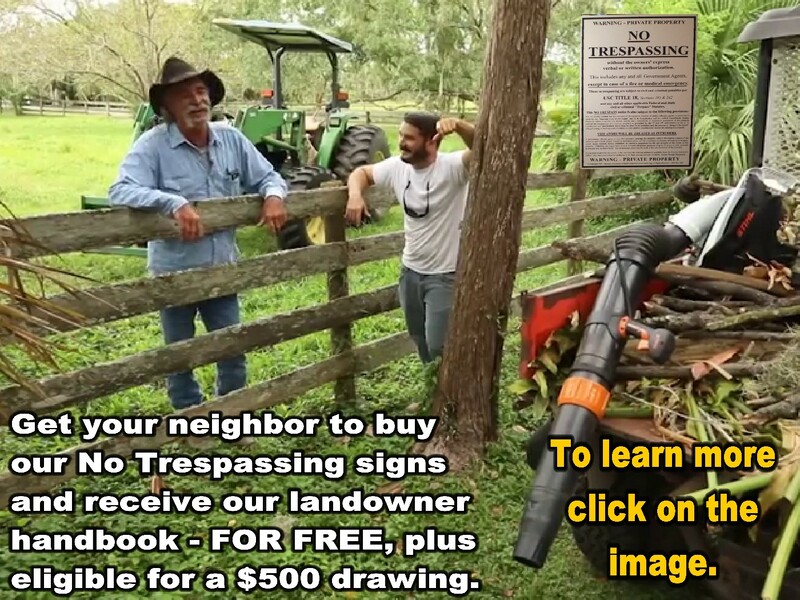 To see the details and a picture of our large 18" X 24" NO TRESPASSING" signs click HERE. To order by check or money order, fill out the Order FORM here, print it and send it with a check or money order for the correct amount, in U.S. Dollars, to the address shown on the form.